The purpose of this exercise is to help you understand Evernote and OneNote. You have already shared an EverNote folder with me. During our Online Presence exercise, you created a folder with a name like Prog280-LastName, where LastName is your last name. You shared that folder with me and placed at least one document in it. You are going to add another note to that shared folder. In the free version of Evernote, the owner of a shared note can edit it, but the recipient cannot edit it. This means that you can edit the notes in the folder you shared with me, but I cannot edit them. To allow more than one person to edit a note, you must upgrade to Evernote Premium. In this course, we will use the free version of Evernote. In this exercise, you will add a new note to the folder that you shared with me. You can create the note in the EverNote application, in a web browser, or on your mobile device. You should use the tools found in Evernote to create the list. 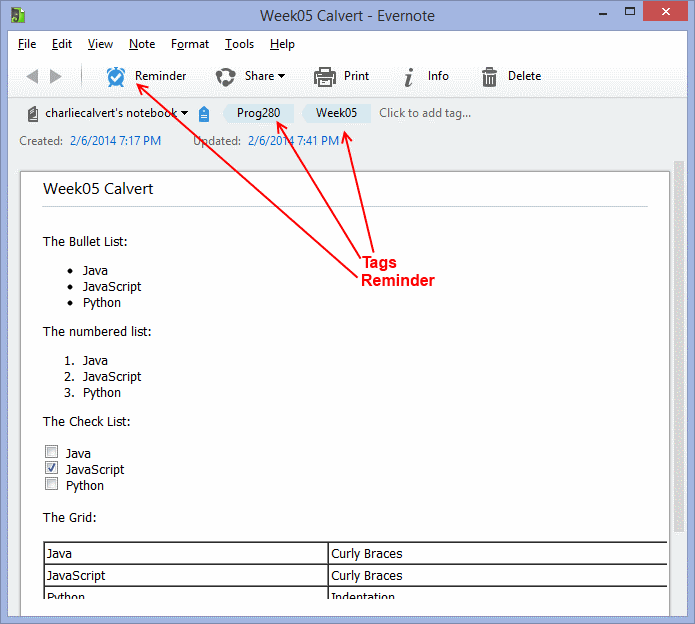 The tools for creating a bullet in Evernote are exactly the same as in any other editor. Add a grid with two colums and three rows. Place your list item in the first column and a related comment in the second column. The note looks very much the same in a browser. The look on an Android device is a bit different, but not radically so. Perform the same operation in Microsoft OneNote. To create a OneNote folder, select the Create menu item in SkyDrive, and then choose to create a OneNote notebook. You might find it most useful if you do all your work in a web browser or mobile device, and not in Microsoft Office. You probably already know how to use Microsoft Office, so stretch yourself a bit and learn to use other tools. You will have to share the OneNote Notebook that you create with me. Share it with same address that you used when sharing the SkyDrive folder with me. (The point here is that I don't think it is possible to put a OneNote notebook in a SkyDrive folder. So you have to create the notebook, and then share it with me. Once you have shared the folder with me, then you can create more notes in the folder and I will see them automatically. Unlike Evernote, OneNote provides the ability to share notebooks that both parties can edit. To turn it into a list item, right click on it, and use the tools that pop up. To create a grid, use the Insert menu. Both are official Microsoft apps. 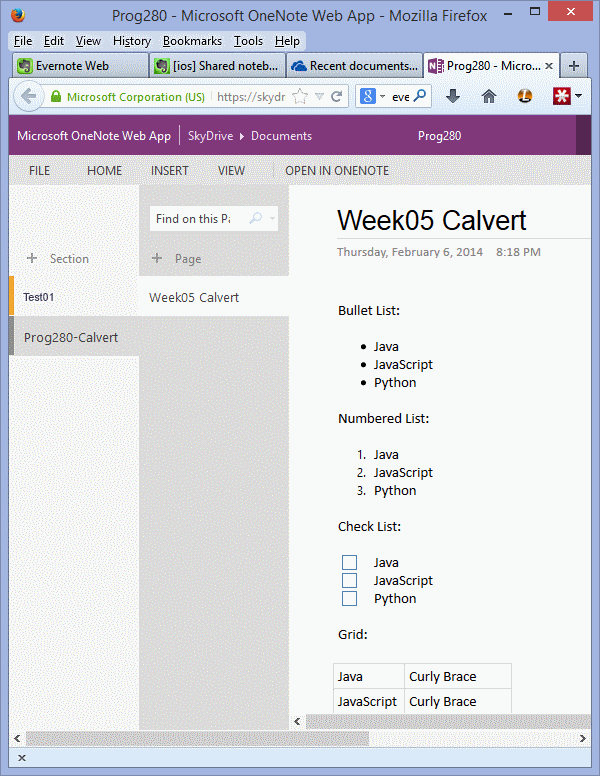 For Word and Excel documents use SkyDrive, for OneNote use, OneNote. When you are done, submit links to your folders use the Canvas text tool.